Our website uses a simple system of filters to help you find the products you require. This guide shows you how to navigate a category by filtering to display all the products that meet your criteria. To begin, navigate to any category on the website. The simplest method to do this is to use the top menu drop down bar. For example, if you require a straight handrail for the bathroom, hover over 'Bathrooms' to display the drop-down menu. Then select the 'Straight Rails' category under the 'Handrails' heading. For this example, we are going to try to find a straight handrail which is 600mm in length, white colour, with concealed fixings. Under this header will be a series of filter titles such as 'Price' and 'Manufacturer'. 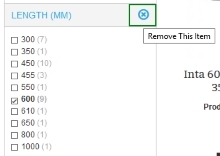 Under each filter title are filter options which are selectable. For example, under 'Manufacturer' may be the option 'Contour Showers', and clicking this option would display all handrails made by Contour Showers. The page will now load and display only handrails that are 600mm in length. Using this method, we can now locate the filter title 'Colour' and select the white colour icon. The page will refresh again, this time displaying only handrails that are 600mm long and white in colour. This filter selection process can be repeated as many times as required in order to find the product that meets your requirements. Using our initial example, we may wish to filter the results further by selecting 'Concealed' under the 'Fixings' filter title. 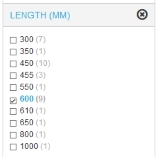 Tip: The number in brackets next to the filter option is the amount of products that will display when the page reloads. The page will then refresh and display products without that filter. Tip: You can also select the 'Clear All' button at the top of the page to remove all the filters at once.